Mummy-Tips: FunnyGirl Makes it to the finals!!! FunnyGirl Makes it to the finals!!! I had been having a pretty bad day in all honesty. Then this afternoon I had a call from the people at Angelina Ballerina. We went to see the stage show earlier in the year and when we were there we picked up some information on the Angelina Ballerina Children's Award that is being run in conjunction with the National Dance Awards. I sent off a tape of FunnyGirl ages ago and didn't think anything further. Then today I got the call to say that she had made it to the final shortlist of 25 young dancers and she will be given her chance to audition along with the other 24 finalists for the panel of famous judges in London! I am so amazed - in all honesty, I think that she has that special something, and she has certainly inherited my dancers feet but I am so proud of her. So on Monday, we will be bunking off school and heading off to the English National Ballet for FunnyGirl to perform. 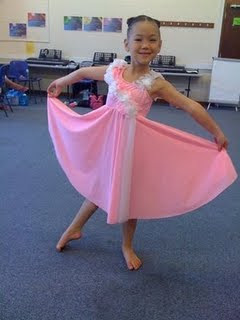 Luckily she has been practicing really hard for her second dance festival on Saturday - so her piece is in tip top form. I will be sure to keep you all posted.